Disney’s science fiction franchise “TRON” is always a popular topic here at Inside the Magic, as our founder and Editor in Chief Ricky Brigante is a certified TRON aficionado. 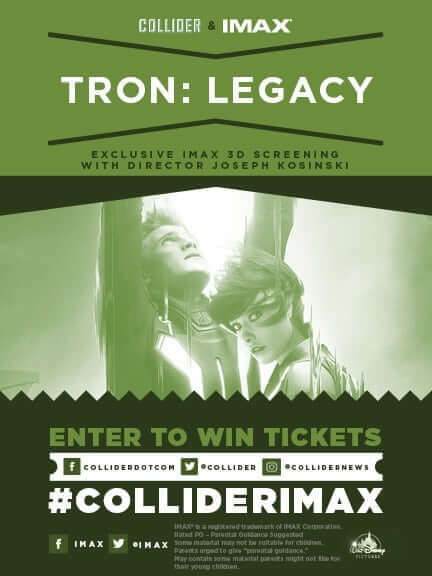 The good news for Tron fans today is that the film website Collider announced a revival screening of the 2010 sequel “TRON: Legacy” in IMAX 3D utilizing– for the first time in Tron history– state-of-the-art laser projection technology. Unfortunately for Ricky, this screening will be hosted by Collider in Los Angeles, where I live and he doesn’t. Sorry, Ricky. “TRON: Legacy” director Joseph Kosinksi will be on hand after the screening to field questions from the audience. To enter for a chance to win tickets to the screening on Thursday, March 2nd, be sure to visit Collider’s official RSVP page. The specific venue for the event has yet to be announced. Is the only way to go to this event to win tickets??? Im in LA and would kill to go!! !